Once you have logged in, click on the name in the menu of the page you want to edit - for instance your Home page (if it's a brand new site, then it probably already has some default text on it which you should delete). The page will load, revealing a blue control panel in the page featuring an Edit Page and Page Properties buttons . . .
Click on Edit Page and a blank text field will appear, topped by a formatting toolbar similar to those you will have used in Word or similar word processing software. You can then type new text into this field, or copy and paste it from a text editor such as Notepad. Then, selecting the text you wish to format by clicking and dragging your cursor across the text you want to change, use the buttons in the formatting bar above the text to change font sizes, add links and horizontal rules, indent text or make bulleted lists, change text justification and of course set text to be bold, italic or underlined. 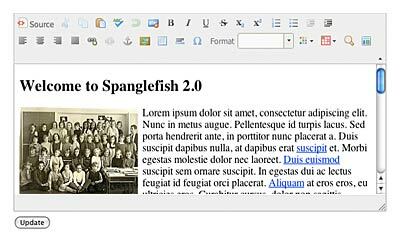 You can also use the image icon on this toolbar to insert new images into the page. Once you've made your changes, click the 'Update' button at the bottom of the page. The page refreshes automatically and your changes are immediately visible. If someone else is viewing your site at the same time, the changes are visible to them too, but not the text editor or editing buttons! That's how easy it is. Tip 1:- Don't spend ages typing long sections of text into the editing field. The text field is actually a web form and if your computer crashes or your internet connection goes down you could lose what you have typed. It's better to type it out in a simple text editor first (such as Notepad or Wordpad on a PC, and TextEdit on a Mac), and saving it as you go, and then copying and pasting it into the web page editor when you have it. Tip 2:- If, after making changes in the editing section, you decide you do not want to publish them after all, then simply don't click on the 'Update' button, and your changes won't be recorded.